Welcome to Eskridge, Gateway to the Flint Hills! The 2019 Consumer Confidence Report is now available on our Utilities page. Eskridge is located in Wabaunsee, [WB], County, along the Native Stone Scenic Byway on Highway K4. 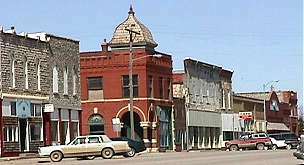 Founded in 1869, the town is rich in history and prides itself as being the “Gateway to the Flint Hills”. 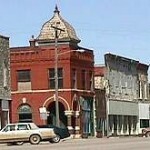 Downtown Eskridge has a distinguished old bank building on the main corner (pictured at right). It is on the National Register of Historic Buildings. It’s still in use today by the family as the Waugh Law Office. 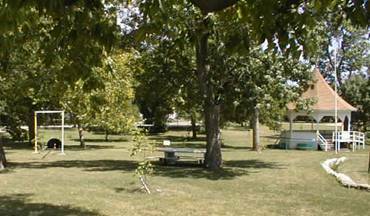 The City Park (pictured at right) has hosted many events from community picnics and ice cream socials to parades and weddings. Children can enjoy a pick up game of basketball and the young at heart can pitch a game of horseshoes. A recent addition to the park is an All Veteran’s Memorial located in the southeast section of the park. Lake Wabaunsee is located five miles west of Eskridge on Highway K99 and K4. The lake is one of only a handful in Kansas that has cottages and year-round homes right on the lake shore. The City of Eskridge purchased the lake from the Lake Wabaunsee Corporation in 1937. It is a great source for our public water supply and recreational uses. Nestled in the Flint Hills, the drive around the lake is well worth making a side trip to see. A trip around the lake and you will see why this is a special place. 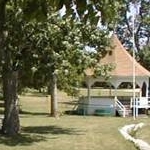 Eskridge is host to several annual events including the Eskridge Labor Day Rodeo, Veteran’s Day Parade, Fourth of July picnic in the park, a fireworks display at Lake Wabaunsee and the Eskridge Fall Festival. Come spend a day with us and enjoy the relaxed atmosphere of small town America.